Love is what makes us fully human and it’s very timely to radiate and spread more of it this holiday season esp. to those who are less fortunate. 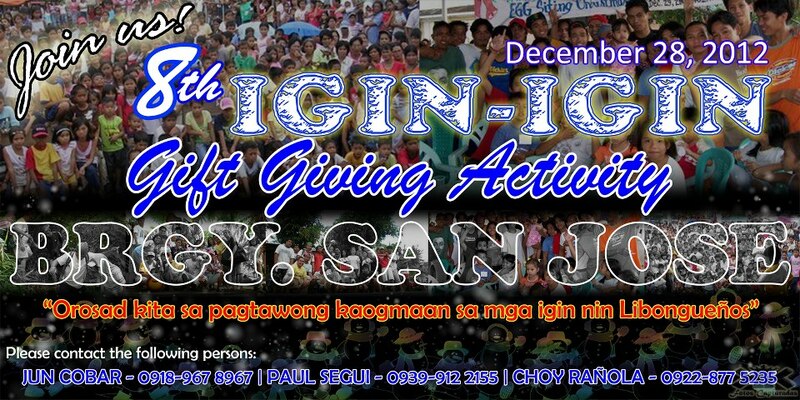 We are inviting everyone, particularly the residents of our beloved hometown, Libon Albay, to lend a helping hand and actively participate in this year’s 8th Igin-Igin Gift Giving Festival at Brgy. San Jose. "Igin" is a Libongueño dialect for “child” and yes, to put a smile to one child’s face is equated to making the Lord Jesus Christ blissful. Merry Christmas and Happy New Year everyone! Watch out for an upcoming outfit post. Meanwhile, let us all make the best out of the holidays. It’s not superficially all about sparkles, luxury, and many other material things. In a deeper sense, it’s what’s within that will always make us heroes even in our little ways - our innate goodness.